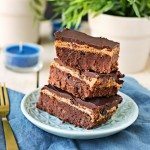 These Vegan Buckeye Brownies are my favorite peanut butter brownies – not only because they are vegan. 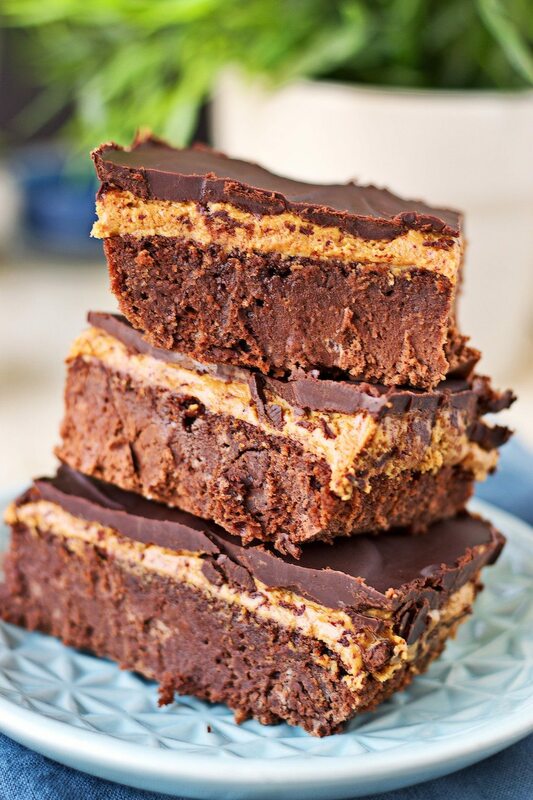 It’s the combination of chocolate brownies with peanut butter that makes my them irresistible. Let this become your favorite plant based brownies recipe, too. If you are a regular visitor to my blog, you know that I have already posted quite a number of recipes for vegan brownies here on Contentedness Cooking. And I’m very proud of all of them. From my Salted-Cashew Orange-Cranberry Brownies to Cherry Hazelnut Brownies. All of those are awesome vegan chocolate brownies that you should not miss. They are easy to make, absolutely delicious, and will satisfy all you sweet cravings. But honestly, this new Buckeye Brownies recipe just rocketed straight to the top of my list of favorites. It’s so chocolaty, full of scrumptious peanut butter, rich and fudgy. There wasn’t a single rational reason why I set out to make this recipe. I simply wanted to have this for a long time already. Ever since I saw these kind of brownies for this first time in a bakery a while ago. Of course, those had a lot of milk and butter in it. But now it was as good time as any to dive head first into making a dairy-free version. When you look at many traditional chocolate brownies recipes, not only are they not vegan but also full of sugars and bad fats. Those of course I wanted to avoid. Therefore I used coconut blossom sugar and other natural sweeteners like maple syrup for the dough of the fudge brownie bottom layer together with gluten free flour, raw cacao, and plant-based milk. This is also why the light layer is pure unsweetened peanut butter – no additives, no preservatives or any other artificial stuff! For the top chocolate layer, I used melted vegan chocolate, a bit of coconut oil, and more maple and plant-based milk. For the brownie dough combine all ingredients in a large bowl and mix well. Then grease a baking dish (approx. 10 x 7 inches) with the extra coconut oil. Transfer the dough to the baking dish and spread it evenly. Bake for about 25 minutes and then let cool a bit. To add the filling and icing, start by smearing the nut butter evenly over the chocolate brownie. If it’s still a bit warm, it helps making the butter softer. Melt the dark chocolate in a small saucepan at low heat. If you give this a try, tag me on Facebook and Instagram, get a picture and show me your excitement. 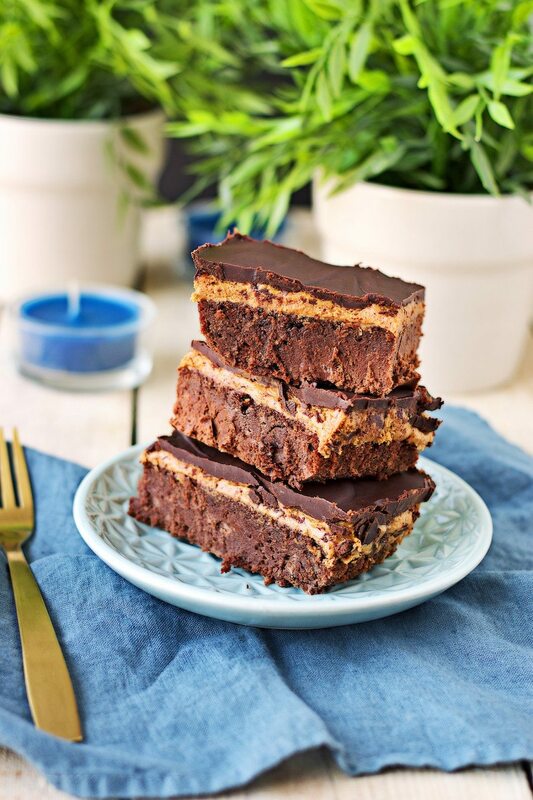 These Vegan Buckeye Brownies are my favorite peanut butter brownies – not only because they are vegan. It’s the combination of chocolate brownies with peanut butter that makes my Vegan Buckeye Brownies irresistible. Let it become your favorite brownies recipe, too. Grease a baking dish (approx. 10 x 7 inches) with the extra coconut oil. Transfer the dough to the baking dish and spread it evenly. Bake for about 25 minutes and then let cool a bit. Start by smearing the nut butter evenly over the chocolate brownie. If it’s still a bit warm, it helps making the butter softer. Melt the dark chocolate in a small saucepan at low heat. When it’s melted, mix in the remaining ingredients and – again – make an even layer on top of the nut butter. Store in the fridge to cool and make the chocolate top harden. Then enjoy! What what!!! Can I have 50? I NEED these!! I am buckeye football fan and a peanut butter and chocolate lover–totally for me! 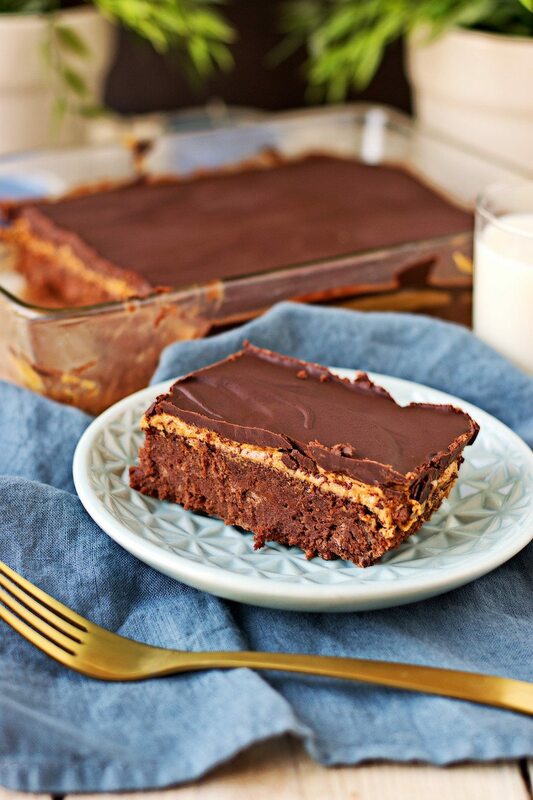 Chocolate and peanut butter is one of my favorite combinations, these brownies sound incredible! My 2 favorite things! Love these! Florian, I’m moving in with you. These brownies are totally EPIC. Like I said earlier, these are the sexiest damn brownies I’ve seen. I want the whole pan, haha! Gorgeous pics and closeups and I LOVE that they are fudgy. I cannot stand cakey brownies, they need to have a fudgy element to them. Beautiful recipe as always! Also, the 3 layer thing is amazing!! I make a triple layer chocolate fudgy brownie bar layered thing with raspberries and I love it so much, but this one tops that big time! 🙂 In love. Haha, you need to wait two more weeks before moving in. Then the new house will be ready (I hope!) and there could be an extra room 😛 Thanks so much for your great feedback, Brandi! Bahaha! I can wait, as long as you have these waiting for me ? I will make 2 batches for you! ? I had to hold myself back from licking my computer screen. Those brownies are perfect! 🙂 well, I’m glad that my brownies had such an effect, Kristen! Thank you! I have no words!!! Except FANTABULOUS!! Oh man I could totally go for one of these right now! Your brownies look perfectly moist. Great flavor combination! These vegan brownies are not just a delight to the eye but a joy to the palate, too! Looks so scrumptious! Oh my goodness these look amazing, Florian! These could definitely become favourite brownies around here! Mmmm, I could just sit and stare at these all day! They look so good. But, you know know what would be even better? To eat them all day! Yum! These look unbelievably delicious! Pinning to my dessert board. I love that these are vegan too! These look amazing! Do you think they’d be freezer friendly? Hi Talia, I haven’t tried it before but I think why not.